Speak Schmeak: What do you fantasize about to avoid public speaking? 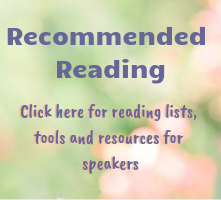 What do you fantasize about to avoid public speaking? Today I was talking to my husband and one of his colleagues about public speaking. Both of them revealed that they had wished injuries upon themselves at one time or another in order to avoid a public speaking engagement. My husband said that, on his way to a speaking engagement a few years ago, he kept wishing he would get into a car accident so he wouldn't have to do the gig. His colleague remembered fantasizing about throwing herself from her second story dorm window to avoid performing in a play during college. I've never had these kinds of fantasies, but I also can't remember a time when I so dreaded giving a presentation that I desperately wanted to get out of it. How about you? 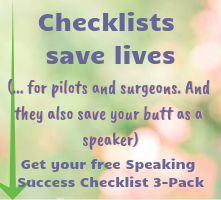 Have you every fantasized about getting out of a speaking engagement through injury or illness? Share the gruesome details here! Can't say that I have ever really thought about that...haha. I guess it would be somewhat normal...hope you had a nice weekend! Never fantasized about being in an accident... but I have feigned illness. It was about fifteen years ago now. I was in school and we were taking turns to read aloud from a novel in English class (a true nightmare for someone who stutters!) and I told the teacher I felt sick just before it was my turn. To this day I still remember how silly I felt as I sat in the nurses office perched on the end of her 'sick bed' when there was nothing wrong with me. Except of course, for my public speaking fears gettin' the best of me. I guess it doesn't occur to some of us, Harmonia! Love your story, Ross! You've come a long way! What a coincidence; I was just reading this article, and the public speaking coach quoted said that she's "come across those who hope they will crash their car and end up in hospital to avoid giving a speech." I'm just fascinated by this!